Main Street Gazette: Melody Time Brass Horn Band Co.
Melody Time Brass Horn Band Co. The entrance to Pete’s Silly Sideshow in the Magic Kingdom’s Storybook Circus features a cutout of Pete, beckoning to the masses to come and visit his attractions. While Pete isn’t a full-fledged barker here, he is leaning upon a rather curious calliope. The Melody Time Brass Horn Band, featuring Toot, Whistle, Plunk, Boom, harkens back to a day in Disney animation when music was the story. Melody Time Brass Horn Band, also noted as the Melody Time Brass Horn Band Co. on the calliope, obviously refers to the 1948 anthology feature, Melody Time. 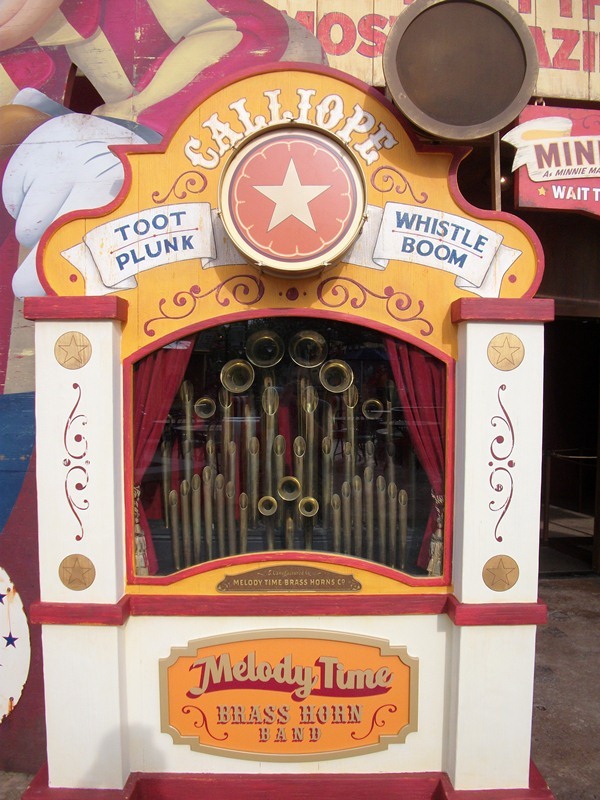 Melody Time was made up of seven shorts: Once Upon a Wintertime, Bumble Boogie, Johnny Appleseed, Little Toot, Trees, Blame it on the Samba, and Pecos Bill. The package film was not as wildly popular as some of those that had come before it, but still had some incredible segments. Blame it on the Samba, which may have felt more at home with either Saludos Amigos or The Three Caballeros, includes some incredible special effects. Johnny Appleseed and Pecos Bill both feature beloved heroes who have become Disney staples in the years since. Meanwhile Bumble Boogie highlights some surreal animation, a possible side effect to the abandoned Destino project that would have brought together Disney and Salvador Dali. Toot, Whistle, Plunk, Boom, on the other hand, tell their own story. The tale comes from the 1953 self-titled short, Toot, Whistle, Plunk, and Boom. Professor Owl is illuminating his class on the origins of musical sound, the four basic sounds that are the basis for all music, Toot, Whistle, Plunk, and Boom. These basic sounds evolve before our eyes into basic and then more advanced instruments, culminating in a full orchestra filled with toots and whistles, plunks and booms! Shown through a stylized form of animation, rather than a realistic form, and filmed in CineScope. Disney had drawn sharp criticisms for using the stylized animation for several years, which the critics considered to have slid into the realm of the obsolete. The critics were silenced by Toot, Whistle, Plunk, and Boom, which would go on to win the Best Animated Short Academy Award that year. Storybook Circus has found many ways to pay respect to the animated features and shorts of old. The calliope in front of Pete’s Silly Sideshow is just one of this nods, and reminds us that music can be just as powerful in animation as the ability to draw a character audiences relate to. This is the first time I've seen attention focused on this detail -- I'm geeking out right now. I haven't set foot in Storybook Circus yet, and it's already one of my favorite lands in any park. Funny how one prop that doesn't even feature any visible characters can connect to so many great memories.